Buenos Aires-Sometimes, the best way to see more clearly, and perhaps appreciate more, a specific issue that is close to home, is to observe if from a different perspective, in a different place. 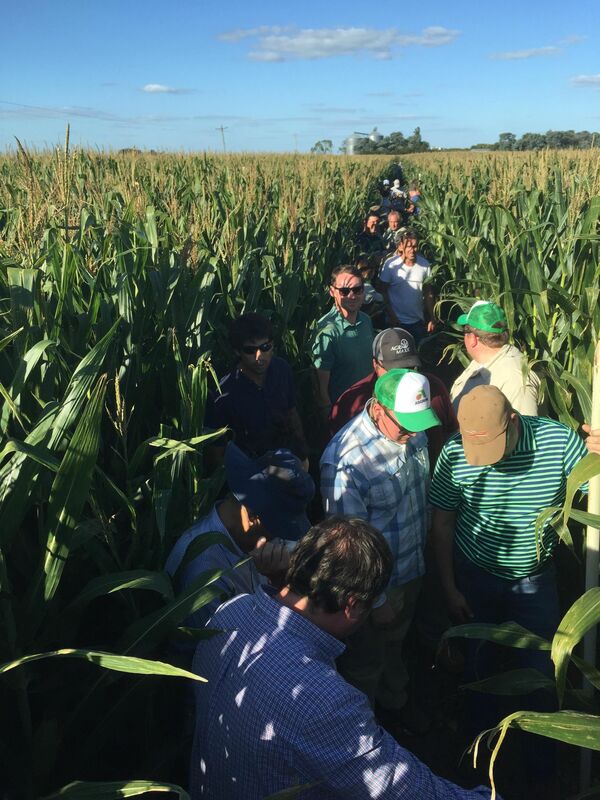 That’s exactly what an alumni group from the Kentucky Corn Growers Association’s CORE (Crop Observation and Research Education) Farmer Program did during a recent trip to Argentina. Chad Lee, director of the University of Kentucky College of Agriculture, Food and Environment’s Grain and Forage Center of Excellence led the group of 20 on a tour of farms around the Argentine countryside to experience their agricultural industry and see firsthand the differences between that country and U.S. agriculture. Adam Andrews with KyCorn and a local professor, Dr. Lucas Borras, helped organize the learning trip. The tour included an area that is home to the country’s most productive corn and soybean production, the major port city of Rosario and back to Buenos Aires, where the tour began. “We primarily visited farms, but we had one industry visit, a research facility, and we toured one university to see the research taking place there, as well,” said Lee. He noted several reasons for choosing Argentina for this group to experience, including the fact it is a country with zero subsidies, a very high-taxed system, and a government system that historically, has not been favorable to production agriculture. All this in a country with rich natural resources and good agricultural production. In fact, much of the off-season produce Americans enjoy buying at their local grocery stores, comes from Argentina. Agriculturally, that country and Kentucky have similarities in some areas of crop production. Lee said the Argentine farmers produce corn, wheat, and double-crop soybeans, on some acreage, in the same rotation as is done here. They also utilize no-till planting to the tune of about 95 percent, which they learned from Kentucky producers. He also noted that most of the farms they visited also had cattle. While crop production is comparable in some ways, climate differences between that country and what producers see in Kentucky has some marked differences. From a production perspective, Lee said if you put Argentina and Brazil together, their soybean production is greater than what is produced in this country. However, the country is not currently a major player in the corn market largely because of past governmental policies that favored soybeans. “But, the current government has eased up those policies and is allowing more corn to be grown in Argentina,” he said. In comparing acreage, Lee noted the average field size is about 100 acres, but some are as large as 250 acres, and farm size is normally larger than what is found here. “In order to survive, the typical farm is larger than what you see in Kentucky; larger by a factor of about two and a half,” he said. That would mean a 3,000-acre farm here, would be about 7,500 acres in that country. And Lee said it would take a farm in Argentina about that size to be profitable. Another similarity between Kentucky and Argentine agriculture is, most of the farms there are family farms. There is also more contracted labor on farms there, and often the farmers will not actually own any equipment. “The contracting business there is much bigger and more developed than it is here, and it’s very common for someone to rent some acreage and pay others to plant, fertilize, spray and harvest, never running a piece of equipment, themselves,” said Lee. Crop insurance in Argentina is also much different than in this country mostly because there are no government subsidies to help pay for it or any kind of real safety nets. Insurance can be bought but it is incredibly expensive; so much so, that instead of buying insurance, often farmers will plant crops 600 miles away from each other in a different climatic zone to hedge against negative weather events. Lee said there were many things about U.S. ag and the farmers here that the Argentine farmers found unusual. Lee added that he hopes the farmers who attended this trip took home with them the understanding of how important it is to stay in frequent communication with their elected officials and to maintain a good, positive dialogue about what works for everybody in the community. And while there are marked differences between the two countries when it comes to agriculture, there is something that perhaps most of those attending found to be a pleasant surprise when it came to how hospitable the Argentine farmers were. Lee said that the farmers attending this trip came back from Argentina impressed, but at the same time amazed that the government is so out of touch with the farmers. He added that his hope was these farmers recognize how important communicating with government leaders is and how different this industry can be, outside of the U.S.